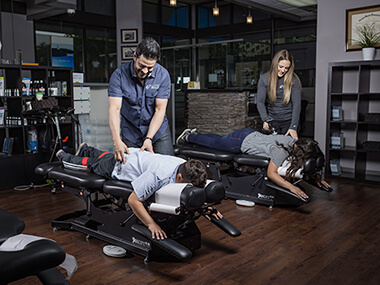 City Centre Health Edmonton Chiropractic is one of the oldest and most innovative in the city. We are always looking for new and scientific ways to improve patient care. By utilizing our various techniques and contemporary modalities, our clinic aims to promote lifelong health, prevention and rehabilitation of athletic injuries, and treatment of acute and chronic musculoskeletal disorders. The doctors and wellness team at City Centre Health Edmonton Chiropractic strive for excellence in their specializations, to assist our patients in reaching their goals. Whether your goal is to increase quality of life by living free of chronic pain, or to increase athletic performance by achieving a more functional body, we want to facilitate your path to success. Chiropractors are health care providers who focus on treating neuromusculoskeletal disorders and the effects that these disorders have on the body’s overall health. Chiropractic is a drug-free, hands-on health care solution to many musculoskeletal and neurological complaints. Chiropractors include patient examination, diagnosis, and treatment in their protocol. The Alberta College of Chiropractors defines a chiropractic adjustment as “a gentle, controlled, and directed pressure that helps to restore the spine’s ability to function and relieve nerve interference.” Chiropractic adjustments are commonly used to treat, but not exclusive to, back pain, neck pain, pain in the joints of the legs and/or arms, and headaches. Why is Posture so important to your health? When posture is bad, pressure on your spine is increased. This can lead to tension, soreness, headaches, back pain and fatigue. Each inch of forward head posture can increase the weight of your head on your spine by an additional 10 pounds! That means if you look down as you read, text, or work on computerized devices, it adds 20 to 30 pounds of pressure on your neck. Over time, this added pressure can flatten or reverse the normal curve in the neck leading to decreased immune function, neck pain, headaches, shoulder pain or numbness and tingling in his arms. Don’t delay. Reach out to our office to get started on your chiropractic journey!